Many celebrities suffering from terminal illnesses choose, for personal reasons, to keep their diagnoses to themselves, preferring to live out their final days away from the glare of the media and even the sympathies of their own fans. Few outside of David Bowie’s inner circle, for example, even knew he had cancer until the day his death was announced. Warren Zevon chose another route. Months prior to his passing on September 7, 2003, from mesothelioma, a form of cancer that affects the linings of the lungs, the 56-year-old singer-songwriter had disclosed his situation publicly. He even discussed his illness openly on The Late Show With David Letterman, an appearance that was both heartbreaking and, thanks to the artist’s humility and grace, heartwarming. The date was October 30, 2002, some two decades after Zevon had first performed for Letterman. In those 20 years, the two men had established a close friendship, with the classic rocker visiting the show on numerous occasions, even subbing for the program’s bandleader, Paul Shaffer, on occasion. 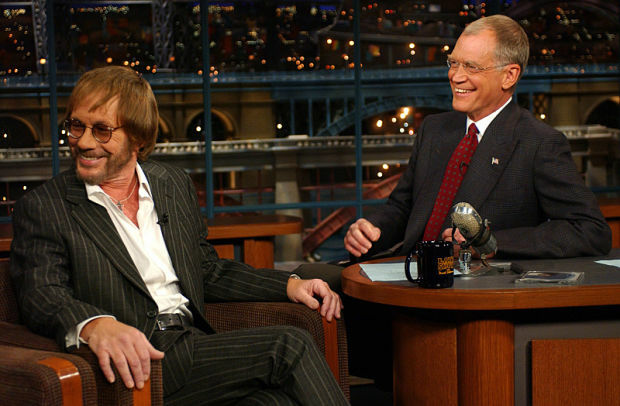 But the 2002 appearance was something special: Zevon didn’t just drop by for a quick song and a chat; instead, Letterman devoted the entire hour to his sole guest. And, in a quip that has since been quoted countless times, Zevon responded succinctly and with humor to Letterman’s question about what his experience with cancer had taught him about life and death. “How much you’re supposed to enjoy every sandwich,” he replied. Zevon also performed, of course, giving the host and audience three classics from his catalog: “Mutineer,” “Genius” and “Roland the Headless Gunner,” the last a personal request from Letterman. Zevon avoided the new songs he’d only recently recorded for his final album, The Wind, which would be released just two weeks before his death. The version of “Roland…,” with Zevon backed by Shaffer and the program’s house band, is a stunner. It would turn out to be his final public performance but Zevon, who’d been given a few months to live, managed to buck the odds and survive for nearly another year, sticking around long enough to experience the birth of his twin grandsons. Our Classic Video: Warren Zevon performing “Roland the Headless Thompson Gunner” on The Late Show With David Letterman. Zevon was born on January 24, 1947.